Been there done that? Write me a review for the website! Read my Testimonials	Write one for me at the bottom! Photo Gallery	Tarpon, Sharks, Snook & Happy Anglers! Perfect for company outings, family reunions, sightseeing! We offer a variety of services for the fisherman and non-fisherman. Ladies and children encouraged to experience the fun! Multiple boats, all with quality Captains. It is approx. a 40-minute ride across the flats and around the mangrove islands to the fishing grounds. There is plenty of action to keep the youngsters' attention or fine tune your fly casting. Ladies and Children encouraged to experience the fun! On full day trips, we can go into Flamingo, an outpost at Everglades National Park where there are restrooms, a small museum, restaurant, gift shop and marina. We are usually fishing within 15 minutes of Flamingo; a fact that many women appreciate because restrooms are nearby! * Check out the photo gallery for a preview of the nature and wildlife which can be seen on these fun trips! , & Everglades National Park Eco Tours also available! Rates are based on 2 anglers. There is a $50 charge for each additional angler. Call (305) 304- 6788. * Evening Tarpon Trip $550. 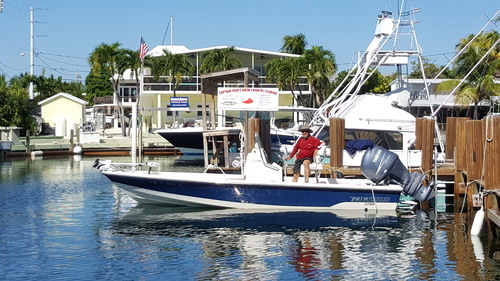 Everglades sports fishing charters, Charter boat / Sport fishing in the Atlantic, Gulf and Florida Bay with USCG licensed and IGFA Certified Master Captain Fred Ferreira and Associates.